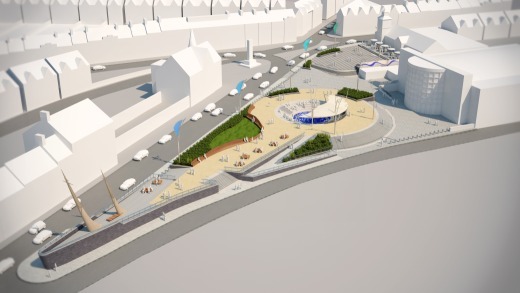 The Station Square Environmental Improvement scheme revitalises this key gateway and arrival point for visitors to Northern Ireland’s most popular resort. 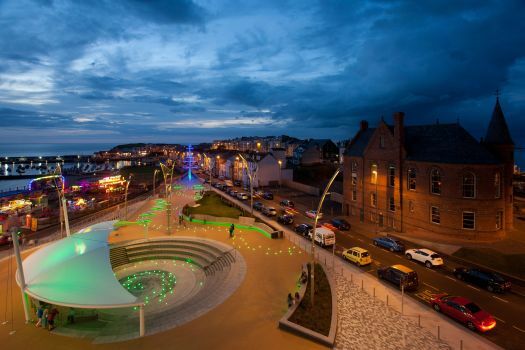 The improvements ensure visitors receive a very positive first impression of Portrush as a modern, inviting, vibrant and dynamic resort. 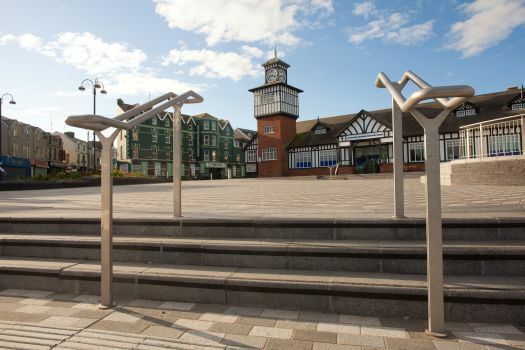 97% of respondents said they liked Station Square in a public perceptions survey conducted during September 2012. The full survey is available at the following link:(Station Square Public Perceptions Research 2012). 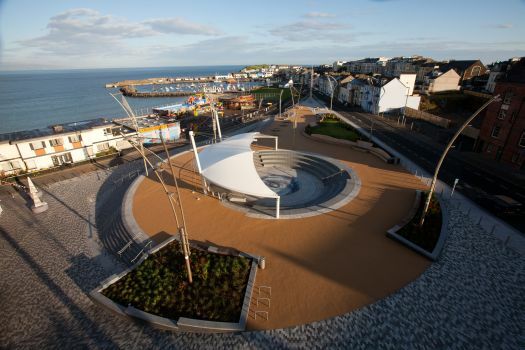 Station Square sets a high design standard for Portrush with natural materials predominating throughout. The scheme also complements the richness and heritage of the neighbouring listed Victorian railway terminus and the Town Hall. 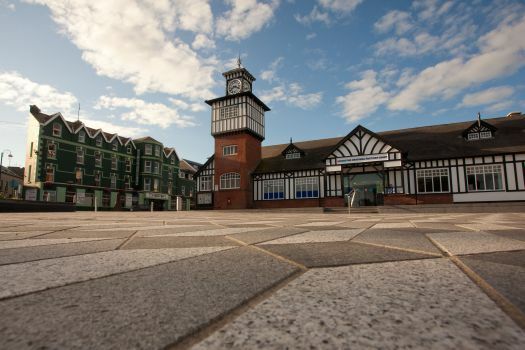 Station Square therefore provides a warm welcome for everyone and encouraging more frequent return trips with visitors staying longer each time and thereby increasing economic activity within the resort and the borough. The scheme, completed in June 2012, was designed by The Paul Hogarth Company. Following comprehensive public consultation at the design phase and a full open tendering process, Council selected F.P. McCann Ltd. as the main contractor. The scheme subsequently met all its key targets including completion and budget. 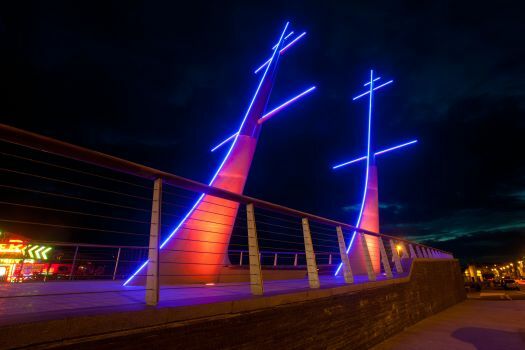 The Department for Social Development provided £1,000,000 plus contingency funding towards the capital cost and the Northern Ireland Tourist Board contributed a further £250,000 in matchfunding. 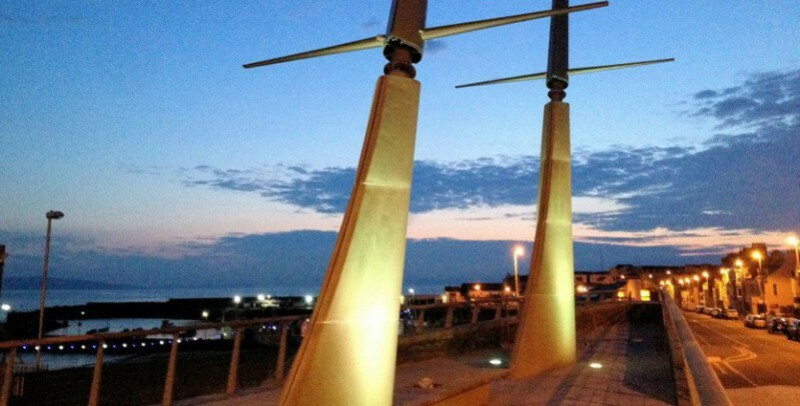 Coleraine Borough Council contributed £750,000. 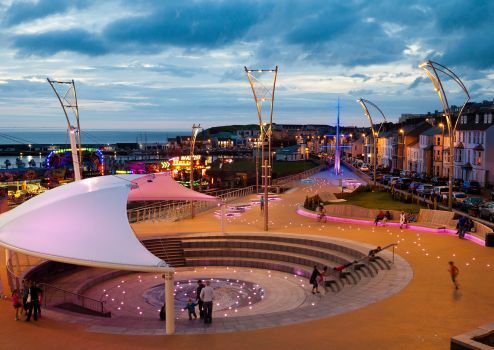 Council is grateful to its funding partners for their ongoing support through the effective delivery of the Portrush Regeneration Strategy. Upper Station Square - immediately adjacent to the Victorian listed railway terminus building, the open uncluttered space provides a quiet reflective area within the busy resort. The simplicity respects the adjacent listed building but is sufficiently flexible to accommodate modest sized street entertainment and events. Barry’s access – this is one of the most heavily used footways in the resort and fully complements and facilitates the generations old Barrys Amusements attraction. 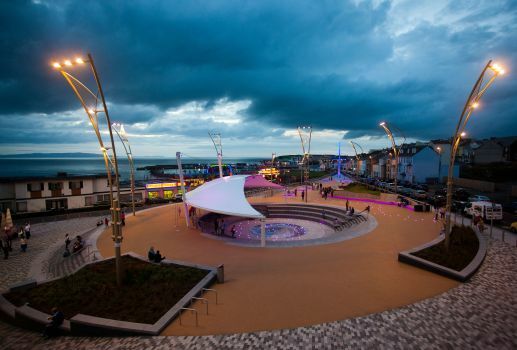 Barrys is synonymous with Portrush and is now more closely integrated and accessible benefitting from the high quality access points and materials used for the public realm works. Amphitheatre – the recent survey highlighted this is the most popular area within the scheme. Whether it’s the sail-like canopy the wonderful ‘mackerel’ mosaic by international artist Orla Kaminska, the quirky coloured lighting scheme or the unique wood seating arrangements but the amphitheatre is particularly attractive for young families. The amphitheatre is a wonderful location for more formal entertainment and capable of accommodating several hundred visitors. The permanent staging area has access to electric, water and broadband. The Prow – this area provides an excellent elevated vista over the West Bay, the harbour and onto to Donegal. The second most popular area in Station Square, the Prow encourages visitors to linger longer. Lighting is a key design feature of the scheme adding another dimen'sion to the unique ambience of Station Square. 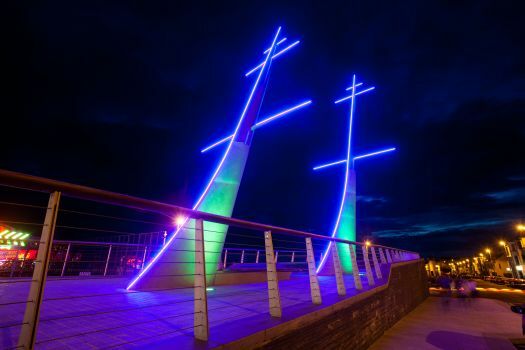 The resort, and particularly the residents, also greatly benefit from Council keeping the low-energy lighting glowing through the winter months adding a welcome bright and vibrant heart to the town throughout the year. A series of computer controlled lighting programme change colour, rhythm and pace on a series of 15 minute cycles. The effect is to maintain visitor interest in the obvious quirkiness which is the essence of Station Square. Like Portrush overall, it’s a fun place to be.